I run this website. Before I publish a recommendation to the whole world, I need hard data that proves it really works. I was originally a doubter. When I was introduced to the credit card game I was skeptical it would all work; when I started the gas savings game I wanted to find out if it was worth it (it was); etc. It’s a hobby. Keeping track of all this stuff is very enjoyable to me. Yeah, I know, it’s a pretty OCD hobby, but I love it! Life is busy. You don’t have to reinvent the wheel. I record, track, and summarize the results of my own experiences with these tactics so you don’t have to. Use the data presented on this site to make your own determination if something is worth doing or not. It will save you time, energy, and headaches. 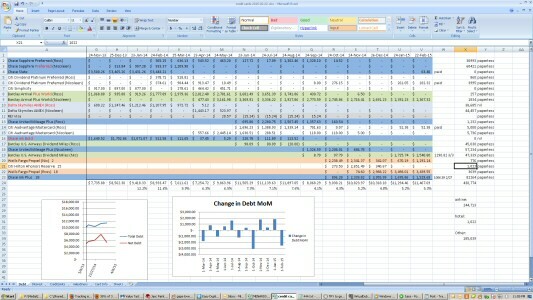 But of course, if you want to make giant spreadsheets and stare at them late into the night, make graphs and print out reports, go right ahead! You may find it’s fun to see exactly how much value you can create by using the tactics outlined on ValueTactics.com. Check my personal results tracker on the sidebar, read my weekly updates, read about individual tactics, scour the web for others’ results, and make your own decision whether a given tactic is worth it or not. I’ll respond to the second part of the nay-sayers’ comment, “I’m not organized enough to make it work,” in another post. (Click here to read that post!) Don’t miss any new posts: Follow me on Twitter, like me on Facebook, or subscribe to the RSS feed. This entry was posted in Philosophy, Tracking on March 13, 2015 by Gomanson.